Wednesday was one of the best days of my life—genealogically speaking. Her mother having passed away on Monday, my aunt felt empowered to delve into her drawers and closets to see what family treasures had been packed away and forgotten. When I went to the house at noon, I found a stack of photo albums and loose documents waiting on the living-room sofa. My eye was immediately drawn to a small cardboard box bearing the signature of Elton Dunham, my great-grandfather. Inside was an autograph album I never knew existed. Twelve people signed the book, most offering a poem or aphorism in addition to their autograph. The first, dated Feb. 20, 1895, is from Elton's future father-in-law. His future bride signed next ("On this leaf in memory prest, May my name forever rest"), followed a few months later by her mother and grandmother. 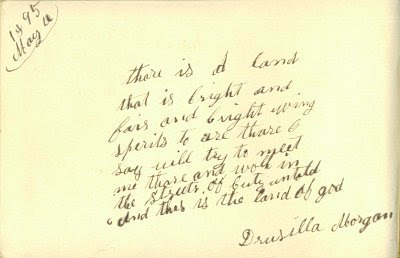 In all, the signatures of five of my ancestors appear in the book—the most remarkable of which is that of Drusilla Morgan, my great-great-great-grandmother (below). She was born Apr. 27, 1820, in the northern reaches of Oxford County, Maine, and died on Sept. 9, 1896—the day that Elton and her granddaughter were scheduled to marry. Exciting as this find was, it wasn't nearly as exciting as the next. I picked up what looked like an old composition book and turned to the first page. It took me roughly half a second to recognize what I was holding. It was the account book of my great-great-great-grandfather Moses Fairfield Coolidge, a storekeeper in Upton, Maine. His outlays for the years 1877 through 1884 were given, together with a list of expenses for fixing up and operating the store. Tucked between the pages of the book were smaller treasures. My favorites are the bills for my Dunham great-great-grandparents' funerals, and the original script for my father's grammar-school graduation speech. So, if I'm lax in posting the next few days, it's only because I find it difficult to type while jumping for joy. How exciting Chris! Treasure chests come in all sizes and shapes and it sounds like you've found one indeed. Congratulations, Chris! What a find! I have found this inflation calculator comes in very handy when looking at prices from the past. This morning I woke to a new treasure. My aunt brought over a second autograph book of my great-grandfather's, dating from 1883 and signed by two more of my ancestors and dozens of cousins. Who knows what she'll find next! My great-great-grandfather's funeral in 1915 cost $48. Using Miriam's calculator, that comes to $932.32. A hefty sum, though not quite as hefty as the bill for my grandmother's casket and service. Congratulations - you won yesterday's genealogy lotto prize of...totally priceless stuff that you never dreamed existed. Enjoy the treasures - I know the feeling - and cherish the stuff. How are you going to presewrve these treasures? I'll probably scan or photograph the pages, and then seal away the originals for eternity. The binding of the account book is the most vulnerable, so it will need the greatest care. I wish I had one of these scanners. Almost everyone in my immediate family was named for Elton. "Elton" is my father's middle name, and my brother's middle name. "Lee" is my middle name and my sister's middle name, and was also Elton's middle name. A priceless set of finds, Mr Dunham - thanks for sharing them with us! Our envy is only slightly in advance of our pleasure for you, I am sure. Now, all you have to do is squirrel these treasures away for a few decades and then just 'accidentally' reveal them to a neice or nephew who has inherited the family history bug, and the family tradition will continue! So pleased for you, though!